Sedum is genus of succulent plants commonly known as Stonecrop. They are one of the easiest and most beautiful plants you can grow indoors. Sedums come in lots of different colors, sizes and textures. 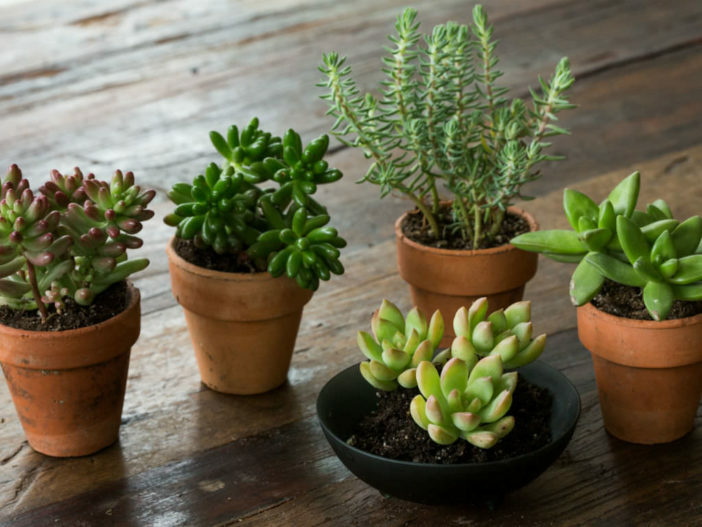 Growing Sedums takes little effort, but you must choose a variety suited to growing indoors and provide the right conditions. Most of the Hardy Sedums don’t do very well indoors. Trailing types such as Sedum morganianum or Sedum burrito work well as hanging plants. Some other choices might be: Sedum nussbaumerianum, Sedum rubrotinctum, Sedum dendroideum, Sedum praealtum or Sedum palmeri. Sedums need plenty of light and warmth to grow well indoors. Place them within a few feet of a south, west, or east facing window where they will receive at least 6 hours of light each day. In hot climates, choose a window with some light shade at midday or sheer curtains covering the panes to prevent leaf burn. A clay pot with drainage holes around the base is the best container for growing Sedums. Just make sure that the pot is no more than 1 to 2 inches (2.5 to 5 cm) larger than the plant’s previous pot. This plants do not need rich soil, but they do need excellent drainage. Choose a succulent potting mix. Fertilizer amendments are not necessary for Sedums. The right care is vital to keeping healthy Sedum indoors. Check the soil every few days by sticking your index finger about 1 inch (2.5 cm) below the surface. Water only if it feels dry, adding water until the soil is saturated and the excess liquid dribbles from the drainage holes. Let the soil dry out completely during the winter, watering only if the leaves start to pucker slightly. Sedums are not heavy feeders, although they benefit from fertilizer during the growing season to encourage lush foliage and ample blooming. A monthly application of dilute liquid fertilizer works best. Use a low balanced fertilizer such as 15-15-15 when growth is vigorous and the days are long and warm. Don’t fertilize in fall and winter to allow the plant to rest.